Ted Haigh (aka Dr. Cocktail) may be this century’s Jerry Thomas when it comes to the world of cocktails. 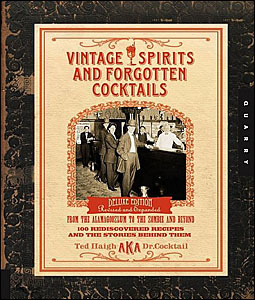 In 2004 he published the now classic book, Vintage Spirits and Forgotten Cocktails: From the Alamagoozlum to the Zombie and Beyond. In 2009 he released a beautiful new and vastly expanded edition of the book with even more recipes, additional historical information, great tasting notes, and fascinating side stories. So when Nicky and I decided to identify a great book on classic cocktails to focus on throughout 2011, we quickly settled on this influential book. Haigh has researched and recreated 100 nearly forgotten century-old drinks which he shares in this witty and beautifully designed book. He has played a critical role in the cocktail renaissance we are enjoying today. So many lost ingredients are now finding their way back onto bar shelves and liquor stores thanks to this book. For the next year, Nicky and I will be stumbling our way through Vintage Spirits and Forgotten Cocktails, creating a couple of drinks each week and posting our thoughts and results. We encourage you to purchase a copy for yourself and follow along with us this year as we explore these unique and forgotten cocktails. Some recipes you may want to try yourself; some you may enjoy just reading about as we mix them up in the lab. If you are just delving into cocktails, or if you are an old pro, this book will entertain, enlighten, and enthuse. And you will learn some great cocktail stories to share! Author Ted Haigh is a graphic designer in the film industry (O Brother Where Art Thou?, American Beauty, The Insider), who has a passion for cocktails. He has been researching cocktails for over 20 years. 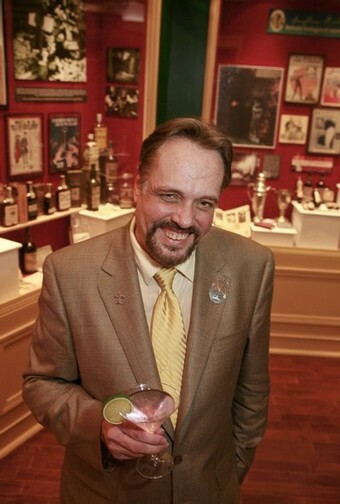 In addition to writing about cocktails, he is also the curator and designer of The Museum of the American Cocktail in New Orleans.